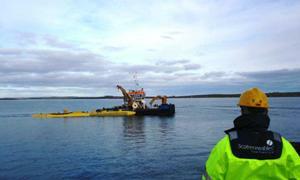 EMEC is delighted to see the Scotrenewables SR250 floating tidal turbine which arrived in Orkney this week. Manufactured at the Harland and Woolff Shipyard in Belfast, the turbine was shipped to Hatston, where it is now in the water in preparation for forthcoming testing at EMEC’s Fall of Warness tidal site. Pictured above, the 100-tonne SR250 is 33m in length with twin 8m diameter sub-surface rotors. Also preparing for the tidal site, Atlantis Resources Corporation are progressing the blade replacement on its AK1000™ tidal turbine. This follows the failure of the experimental composite blades at the tidal test site in August, owing to a manufacturing fault. Fabrication of the new blades (standard GRP blades) is progressing well and nearing completion at Norco in Poole. In April, the blades will undergo a period of dry static testing. The turbine nacelle is undergoing standard, pre-deployment systems testing in Invergordon and the installation of the turbine at EMEC test site is scheduled for completion by mid May, weather dependent. EMEC’s Commercial Director Richard Morris delivered a lecture on EMEC to a Renewables MSc class at Edinburgh University this week. Further academic links were forged with a visit from Professor Steve Chapman (Principal Heriot-Watt), Professor Jim McDonald (Principal Strathclyde), Professor Alan Miller (Deputy Principal Heriot-Watt), and Dr Simon Puttock (Executive Director, Energy Technology Partnership) who met with EMEC’s Research team to discuss knowledge-based opportunities for Orkney, including the development of a Stromness renewables campus.